Diving with sharks again in Leon Dormido! Since I was the only diver, I joined another tour group that was going to snorkel. So it wasn’t a regular dive, but more of a normal tour with diving. We visited Lobos island, where the other snorkel and I checked my equipment and how much weight I needed. I have had different everytime! Haha. The divemaster, Jens (I know, very unusual name for here, but very typical in Sweden! Haha), gave me three tests to do underwater together with him. To clean the mask, to drop and find the regulator and to establish buoyancy. It felt very good to do it before a dive actually! After that, we snorkeled a while at the beach and then we went to el Leon Dormido, also called Kickers rock. It’s some vertical rocks made of ashes If I understood it right. Erosion has split the rock and given it it’s characteristic shape of with it’s got it’s name from. There are two vertical walls about 150 meters with a channel in the middle where all the sharks loves to get in to. We dived around the whole rock and in both channels and saw some marine fauna, octopuses, mollusks, hammerheads, black tipped sharks, Galapagos sharks, sea turtles, sea lions and I think an eagle ray… and of course, a loooooot of other fishes! Unfortunately, I don’t know their names..
It’s really something to swim that close to sharks.. we saw some black tips that were about 2,5-3 meters, which is unusually big here! The hammerheads might have been 4 meters.. and there were smaller ones about 1,5-2 metres. Actually, I’m not afraid to dive around them, just excited.. Maybe it’s because the dive masters aren’t afraid, then I don’t feel like I should be either. But when the sharks do some turns around you and it seems that they are looking straight into your eyes, then it is sliiightly scary… haha. But they don’t do anything. Even the fishes aren’t afraid, around them, only if they get really close to their mouth they swim fast away.. they are more afraid of the sea lions then the sharks! Such an ugly fish hidden in a hole. He had many many small pointy teeth too. A nice mix of fishes. Between the two dives we stayed at a beach for an hour and had some lunch and siesta. The sun was really burning, but while it was, it started to rain. Haha. The weather is so weird here! It really changes in a splish splash. Anyhow. It was a very nice day. 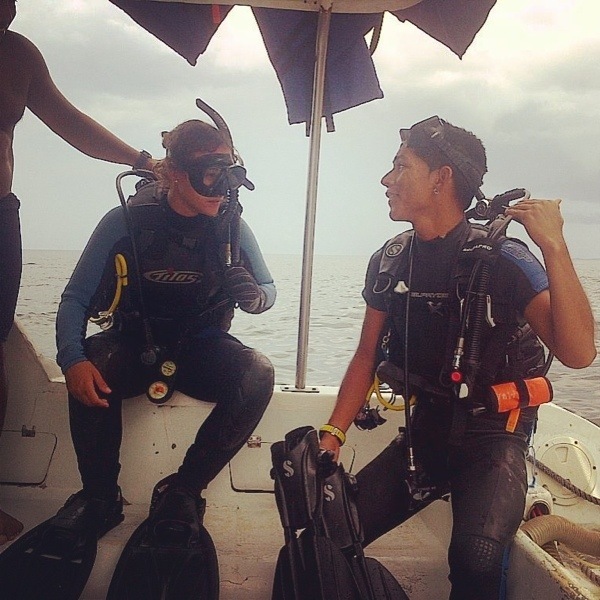 I felt very comfortable with Jens, and it was funny to be the only diver, then I could stay in the water until my air was low, instead of going up when someone elses is. : ) He also said that I was quite good for being so new, that he notice that I love it. Hehe. Yeeep!! I was the only diver, hurray! At night I was really tired. I had some gooood vegetarian dinner at a place called Mockingham bird or something like that, 8 USD. :) And they had internet! I had my computer with me since I had plans on going to the cyber café, but instead I surfed while eating dinner. It’s weird because almost no one was on this restaurant, but if you walk just a block down to the malecon, there is a restaurant there that has a sign of ”wifi”, and there it’s full with people and computers! Well well..
Jens, my divemaster, showing some tricks when we snorkeled. Like if you move the sand in the bottom, the fishes approach, because there are small ”insects” or something they eat that lies below the sand but that they can’t reach by themselves..
At a beach in the tour.. cloudy mountains.. soon going to rain! Haha. They are so straight. . amazing to be caught in a spiral of these. Sea turtle.. they are so peaceful! Love them. In the chanal between the big rocks! A little mollusk! Only like 1-2 cm big! Det här inlägget postades i Ecuador, Galapagos islands, South America och märktes galapagos sharks, sea lions, sea turtles, tipped sharks av sofia armenteros. Bokmärk permalänken. You were on the same boat as me for Leon Dormido! I recognize Jens haha!